I sat in the kitchen dressed in my nightgown, plastic placemat on the table in front of me. The ceiling light gave off a yellowish glow and illuminated the little room. My bare feet swung under the vinyl padded chair; it was winter, but I knew if I placed my feet on the linoleum floor it would be warm. Their house was always toasty. It was late, almost time for bed, and pitch black outside. As I sat at the table on Granddad’s right, we watched Grandma busy herself getting the bowls and spoons ready. It was one of many sleepovers I had at my grandparents’ house, nights away from home that either I requested or my parents desired. I loved those nights because Grandma let me sleep on the couch in the living room, steps away from the bedroom she and Granddad shared. She always kept a light on, and the sheets and blankets she used to make my bed were extra soft, as they most likely covered the beds and sleeping forms of my mother and her four brothers when they were children. I don’t know why the box of Corn Flakes has a rooster on it. What do roosters have to do with cereal anyway? Back then I never questioned it too much; it was just the way things were, and most things were good, familiar. Especially at Grandma and Granddad’s house, where they wrapped me in their loving arms and easily found a place for me in their regularly scheduled lives once or even twice a week. As Granddad poured his cereal, Grandma put the milk and sugar bowl down between us. I watched as he spooned teaspoon after teaspoon of sugar over his corn flakes, and then I watched the milk melt the sugar as he poured. I tried to repeat his ritual, sometimes taking one more teaspoon of sugar than he did. We sat and crunched the cereal that we didn’t have at our house. It didn’t matter; even if my mother would have bought them, I wouldn’t have eaten them anyway, as children infuriatingly do sometimes. Corn flakes were Granddad’s thing, and mine too only when I was sleeping over. Sometimes I listened as Granddad and Grandma told stories or asked me about school or just talked about how Granddad eats corn flakes every night. I wondered how many boxes with the rooster on it he had eaten over the years. Sometimes we were quiet; our mouths were full and conversation didn’t always go that late. After we finished, Grandma took our bowls and rinsed the remnants of our late-night snack into the sink. Granddad turned out the light and we walked into the living room. I helped Grandma set up my couch-bed; she shook the sheets and I fluffed the pillow. Granddad settled in his chair and turned on the TV, and Grandma settled into hers as they waited for me to go to sleep. I was allowed to stay up to watch the news at eleven o’clock if I could keep my eyes open, which almost never happened. My belly full of corn flakes, I dozed off, snuggled on the couch in their nice warm house, safe and loved. Those nights at the kitchen table with Granddad will never be forgotten; surprisingly, I hardly ever buy corn flakes these days, unless I need them for a recipe. They have never changed, much like the memories I have. They are still Granddad's thing, and even though I still don't know why the rooster is on the box, they always remind me of those cherished sleepovers at my grandparents' house. Prompt #4: Thursday, March 7th is National Cereal Day. Write about your favorite cereal when you were a child. How has it changed? I also have only eaten the cereal with the rooster on the box at my grandparents' place. What do roosters have to do with corn flakes? I'd never thought to question that! When we were done with our bowls, my grandma also took our bowls into the kitchen, only ours went to the very happy (and chubby) dog as opposed to down the drain. I hadn't thought about that in years. Thank you for sharing your memory and reminding me of mine. It seems some of us had very similar memories... my husband informed me that he and his granddad also had a similar ritual. What is it with grandparents and corn flakes? Happy to help you reignite your cereal memory! Thanks! Not much has changed since that picture... less fiddle playing, but still the girl looking up at her Granddad. What sweet memories :) Isn't is wonderful how simple little things like spooning sugar onto cornflakes and sitting with a grandparent can have such long lasting effects on a child. This was a beautiful story and I very much enjoyed reading it! Thank you much. Little did I know when writing this that it would resonate with so many people. My granny and papa called them Post Toasties! And I too only ate them at their house. They just didn't taste the same at ours? Funny, huh. Strange little memories we have that sound so meaningless but that can invoke the best warm feelings. Great post! Thanks. It's so funny how many of us ate these only at our grandparents'. And you're right.- they never taste quite.the same anywhere else. Thanks so much for stopping by my page. Sadly my grandfathers were both deceased long before I was born. Come to think of it I don't remember staying much with my memaw as a child, I do remember her living with us for a while but not long. Not all of us have similar experiences, and I hope you have some warm memories of your childhood that you can reflect on. Mine are treasured. This is such a sweet post! I never lived close enough to family to ever have regular sleep overs. If we "slept-over", we did it as a family on vacation. My children live far from their grandparents too. That makes me sad. Hang on to every memory you can! My kids live far from their grandparents too. Maybe that's why I'm so wistful. Such a great story, Andrea. 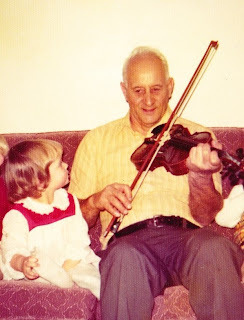 My grandfather had a special thing, too - all of us grandkids had our turns at sitting on his knee while we ate with him. It was great. Those memories are priceless, and how great is that you and your cousins all share one!